A just released convict gets tangled up in the power struggle of a mad scientist who wants to weaponise technology that could effectively change the world. With help from an old scientist who are against the use of the powerful technology he uses the tech to try to stop the evil corporation. The basic feeling I had after watching this was disapointment. 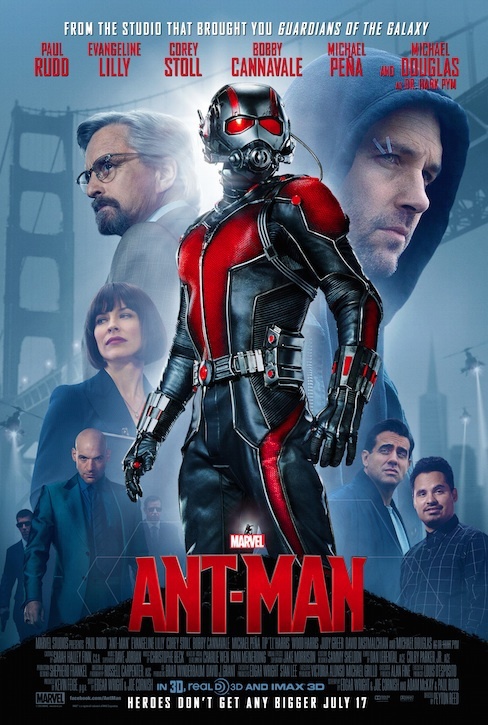 I do not know Ant-Man that well from the Marvel Universe, but I had a feeling that this movie primaryly was done so Ant-Man can be sqeuzzed into the "Avengers" franchise later on. I really did like to the easy going, not too seriuos, approach it had. But if you look at the overall plot, it just seemed a bit thin and not very trustworthy. The inventor of the Ant-Man suit trust it to an ex-con with a master in electrical engineering who can't manage to find a job anywhere else than a ice-cream shop...? The effects was pretty awesome and very belivable. Weirdly enough it was as if the battles in miniature just seemed less impressive since one knows everything is so small. It was only when Paul Rudd's characther Scott Lang engaged with massive amounts of insects that one got the epic feeling that should excist in all super-hero movies. It's a good, fun and entertaining Marvel movie, but not good enough.